Games today aren't as focused on gameplay as they used to be. Many publishers get caught up in graphics and sound, sacrificing intriguing gameplay for a more cinematic experience. Ori and the Blind Forest is a game that didn't get the memo, offering a truly memorable experience that will appeal to fans of many genres. The game was developed by Moon Studios and published by Microsoft Studios. The forest of Nibel is dying. Ori, a Forest Spirit, is cast away from his home at birth. He grows up with Naru, his “stepmother” and lives happily with her until the forest suddenly decays. When Naru takes ill, Ori must venture out and find out more about himself. After a powerful storm sets a series of devastating events in motion, Ori must journey to find his courage and confront a dark nemesis to save his home. 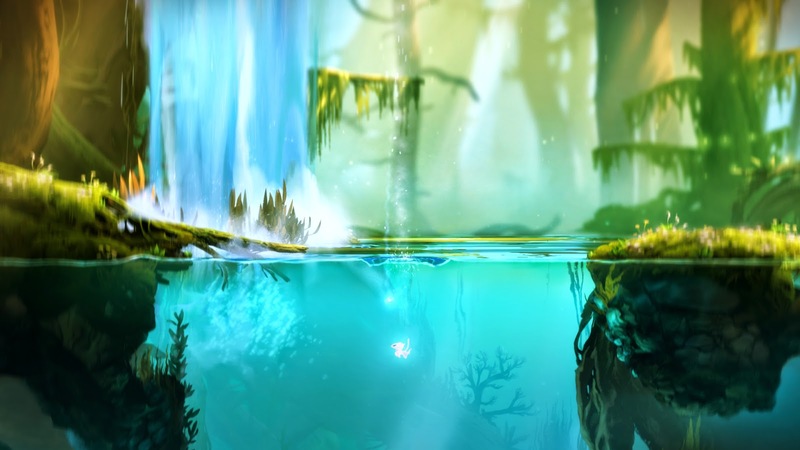 From the start, Ori and the Blind Forest aims to be something special. Ori the character at times resembles a mish-mosh of multiple Pokemon characters and--despite having no dialogue--still manages to impress upon the player his personality. Ori is clearly a character who's capable of handling himself when times get tough, but doesn't hesitate to show compassion when the situation warrants it. And Moon Studios does a great job of slowly presenting all the facets of Ori's personality. 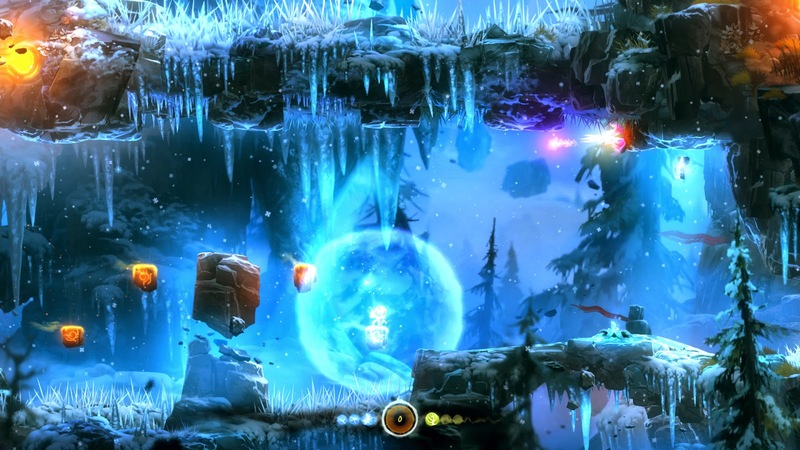 There are moments in the game where Ori helps enemies or risks his safety to save a certain aspect of Nibel. 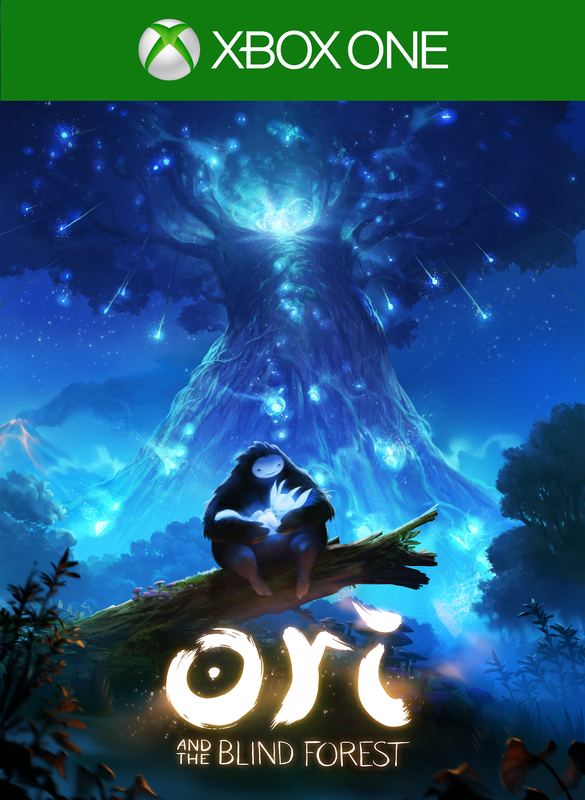 Ori is a fully realized entity whose compassion and generosity are matched by his ferocity and commitment to survival. Not only his survival, but the survival of the forest he calls home as well. 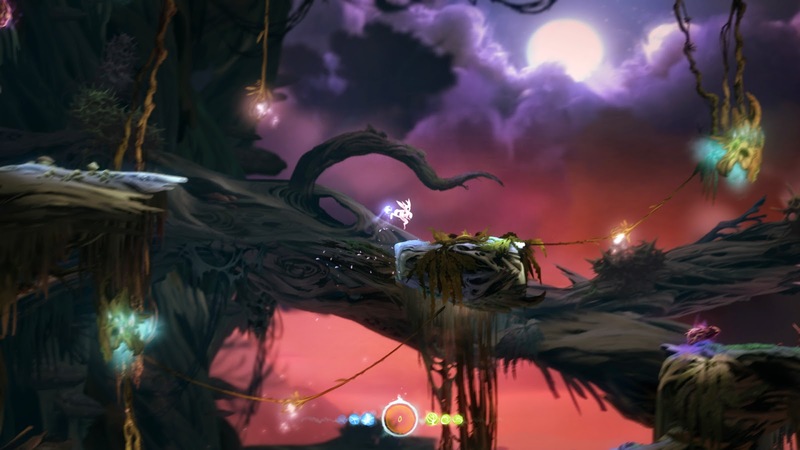 While Ori has no trouble at all showing compassion to difficult situations, there are moments when the player likely won't share a similar compassion. Early press indicated a desire for Ori and the Blind Forest to pay homage to games like Super Mario Bros. or Super Meat Boy. And while Super Meat Boy set some of the more recent standards surrounding difficult platforming, Ori and the Blind Forest doesn't quite reach those levels of frustration. 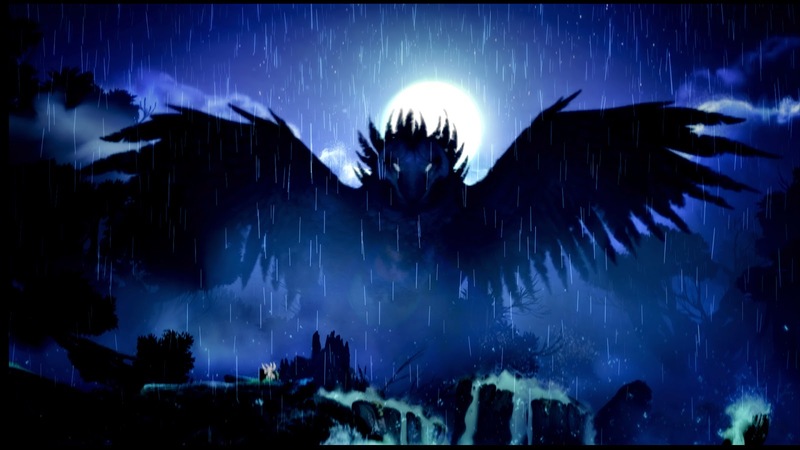 Still, Ori and the Blind Forest has many instances where you will die...repeatedly. Fortunately, you're not shown a reminder of all your failures (like Super Meat Boy)--only a death counter like Dark Souls 2--but once you do complete an extremely difficult area it feels rewarding. The platforming never feels impossible, but it does require the player to use multiple skills in order to make it through. There's one part where you have to escape a flooding tree and the climb to the top is extremely harrowing, demanding attention and quick reaction. There are many instances where you're required to ricochet off multiple walls, capitalize on one of your abilities and then take out an enemy awaiting at the top. If you don't manage it? Then you're back to the last save point. Saving the game is handled in a way that puts the choice of how much you lose upon dying in the hands of the gamer. There are pre-determined save points peppered throughout the immense world, but players can also drop a save point whenever and wherever they want...assuming you have the energy to do so. Creating a Soul Link sets you up to tackle an extremely difficult area, even if it comes at a cost. That cost is that if you run out of energy creating the Soul Link, there may be a door you can't open or an enemy you can't defeat with your super-charged attack. Granted, the energy can be replenished thanks to timely appearances of energy stores or by defeating enemies, but neither of those will help you in that moment when you really need the energy that you used to create the save point. Adding in a Super Metroid flare is allowing the player to find ability upgrades hidden throughout the world, in addition to upgrading player abilities. Killing enemies (and finding certain power-ups) give the player Ability points to spend on upgrading Ori. These upgrades include things such as an improved Spirit Flame for attacking enemies or a magnet ability that draws enemy drops to Ori. Deciding where to allocate points and which skills to upgrade requires some thought on the part of the player, as there are three major paths you can follow in terms of upgrading. You're not committed to any one path, as it's wholly possible to fill out all branches of the upgrade tree if you choose to do so. Outside of the upgrades, players will find Green and Blue orbs that increase life and energy respectively. There's also story-based upgrades that are found in the world itself. These include the ability that will likely garner a lot of (if not the most) attention in Bash. Bash allows the player to target an enemy or projectile in mid-air and launch themselves off of it. As an added bonus, players can also redirect projectiles towards enemies or objectives as well. Bash is definitely the most unique ability, but there are others such as Stomp and Double Jump. Many situations will require you to use these abilities in conjunction with one another and you're given a lot of leeway in switching from one ability to the next on the fly. The controls are complex enough to handle the transitions and are reminiscent of many of the ability switches in Guacamelee. Much of the environment presents itself in a way that requires you to adapt constantly and really helps the player further appreciate the beauty of the game. Ori and the Blind Forest is rendered in a way that feels ethereal and there are going to be inevitable comparisons to Hayao Miyazaki. Comparing the game to his works though does Ori and the Blind Forest a disservice, as the illustrations are strong enough to stand on their own. From the lush green forest to the rotted core of the Ginso Tree, players are given a visual treat in the way of beautifully rendered landscapes. The vividness of the settings depict a hand-drawn world created courtesy of the Unity engine, instead of using something like Ubisoft's UbiArt engine and the attention to detail in the art shows. The look is unique and it's clear the intent was to create a world that felt as unique as its main character. Foregrounds occasionally interfere with the player's vision, but it does so in a way that's not intrusive. Instead, it gives the world more of an immersive feel and at times there's the sense that you're peering around a rock and watching Ori. And Ori's movements are smooth and don't show any hiccups. Bouncing from wall to wall, swimming through grottoes and fighting off enemies all look completely natural and fluid. Accompanying the shining visuals is a sweeping, orchestral score. There were legitimately times when it felt like the game switched over to an Elder Scrolls game, courtesy of the gravitas added to the action courtesy of the instrumentation. Faster-paced sections of the game are accompanied by a frenetic crescendo of music, while slower parts sound like a leisurely stroll through a still forest. Ori and the Blind Forest is--quite simply--a stunningly gorgeous game. It blends together Metroidvania elements with core platforming, both of which mix together very effortlessly. Gameplay hinges on finding the marriage between the two, as there are portions of the game that require a bit of the former and/or a bit of the latter. Fans of Super Metroid will find instances where a door can't be opened without a certain item. Fans of Super Meat Boy will find areas that require patience and perseverance to successfully traverse. Ori and the Blind Forest is a paean to what makes a good game good, even mixing in a tone that throws back to Secret of Mana at times. It's a truly marvelous game that demonstrates a tremendous level of care and attention in making sure the game was done right and Moon Studios did a phenomenal job. The game draws you in from the beginning and doesn't let go. Ori and the Blind Forest is available now for $19.99 on Xbox One and PC. It's slated for release on Xbox 360 later this year.